1 .... What is compilercache and Why do I want it ? 2 .... Is it dangerous to use compilercache ? 3 .... How do I install compilercache ? 4 .... How do I configure compilercache ? 5 .... Show me an example of compilercache usage ! 6 .... How do I clean all those Megabytes of Cache files ? 8 .... Some performance statistics ! 1. What is compilercache and Why do I want it ? Compilercache is under the GNU General Public License (GPL). the result will be picked from the cache instead of being recompiled. manually. If you make a mistake, wrong code will be generated. have to recompile the whole stuff with -g (debugging). now with "make"
> discovered really useful application for it: building RPM packages. 2. Is it dangerous to use compilercache ? have got if you called the original compiler directly. the constellation so that I can fix compilercache. But if I change compiler options like -D_REENTRANT_ or -O2 or -g ? 3. How do I install compilercache ? GNU textutils from your favourite GNU mirror. work as usual and watch the speedup. 4. How do I configure compilercache ? $HOME/.compilercacherc. both are only sourced if they actually exist. of bash commands in the configuration files. /etc/compilercacherc from the template below. you may just cut and paste this if you want to. # CACHEDIR is the directory where the cachefiles will be stored. # you can always erase those files if you want to. # they will be rebuilt as needed. # to all the other users! # because one user can manipulate compilation results of other users! # with his private temporary directory! # SHALLDEBUG can be "yes" or "no"
# LINKOUTPUT can be "yes" or "no"
# links into the CACHEDIR. # but you must take care of the following things !!! # the issues presented here do not affect you. #   then for other hosts the object file links are all invalid. #   so the cache does not behave like a normal compiler. #   this should be no problem though. #   linker runs because make thinks that the .o files have changed. #   it is no harm, just useless operations. # COMPILERPATH directories and NOT in the PATH directories ! 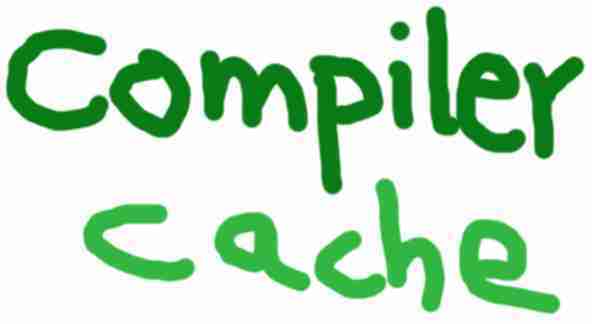 # compilercache will only work together with the listed compilers. 5. Show me an example of compilercache usage ! 6. How do I clean all those Megabytes of Cache files ? If you want to you can just erase them all. sure there are no compilers running while performing this task. call the compiler as a linker. possible and still produce the correct output files. debugging blocks inside the compilercache script. the STRIPPEDARGS option and the sourcefilename. into the output file and the compilercache has finished its work. bitwise the same as if the original compiler would have been run. compiler, only the time consumation is sometimes much less. possible and not wastedly recompile. the same, even though the preprocessor output is different. the cache instead of a recompilation. programmers to not fix typos in comments, which is not a good thing. this and use the cached values whereever possible. let's discuss the techniques used to reach the target. activated if debugging options are turned off. The preprocessor output is fed through a program called "unifier". 8. Some performance statistics !